SORRY – THIS EVENT IS NOW SOLD OUT! all seats for this event have been taken. 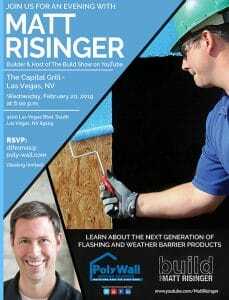 Join us for an evening with Matt Risinger, Builder & Host of the Build Show on YouTube at The Capital Grille – Las Vegas, NV on Wednesday, February 20, 2019 at 6:00 p.m. at 3200 Las Vegas Blvd. South. Space is limited so please contact dthomas@poly-wall.com to reserve your seat now. SORRY – SOLD OUT! Learn about the next generation of flashing and weather barrier products!